Belmont Hospital introduced a 24-hour escalation plan and daily emergency report, to help Emergency Department (ED) staff manage periods of high demand, without reducing the quality or timeliness of patient care. To improve Emergency Treatment Performance (ETP) by 5% within five months. Improves communication and leadership between nursing and medical staff. Improves accountability for ETP targets, emergency re-presentations to the ED within 48 hours and transfer of care targets. Enhances patient admission times, experience, satisfaction and health outcomes. Improves staff efficiency and collaboration among healthcare teams. Reduces the number of patients who do not wait for care (‘Did Not Wait’). Improves staff awareness and communication about the level of activity in the ED waiting room and ambulance bay. Provides staff throughout the hospital with a better understanding of how peak periods in the ED impact their service. Supports evidence-based decision making and clear documentation. EDs are under increasing pressure in NSW, due to the high demand for emergency services. Prolonged stays in the ED can result in overcrowding, delayed ambulance access, reduced patient and carer satisfaction, and an increased risk of adverse outcomes for admitted patients1. To improve access to emergency care, NSW Health states that 81% of all ED patients should be admitted, referred or discharged within four hours. This is known as ETP. Research shows a clear link between performance against this four-hour target and in-hospital mortality2,3 for admitted patients. there were limited resources at Belmont Hospital ED, including one registrar on weekends and after hours, as well as limited pathology and radiology services out of hours. In 2016, ED and executive staff from Belmont Hospital attended a workshop with the aim of addressing these problems, by improving communication and key performance indicators. It was determined that a 24-hour escalation plan would alleviate the demand on the ED and improve ETP, providing patients with high-quality care in a timely manner. A half-day workshop was held in February 2016, to discuss how the team could improve ETP in the ED. Three workshops were held in March and April 2016, to develop a 24-hour escalation plan in collaboration with the ED team, including medical officers, nursing staff and the Deputy Director of Nursing. These workshops were led by the Emergency Nurse Practitioner. A 24-hour escalation plan was developed, based on common triggers in the ED. It clearly states what action is required during times of business as usual, moderate compromise, severe compromise and extreme compromise. The responsibilities of each ED role are also documented, to ensure prompt action can be taken and responses can be gradually escalated to more senior staff members. A daily emergency report was developed, which documents surges in the ED and the action that is taken according to the 24-hour escalation plan. ED staff can add comments to describe why the surge occurred and the measures undertaken to de-escalate the situation. A position description for nursing team leaders was developed, outlining their responsibilities in managing the 24-hour escalation plan and daily emergency report in the ED. Fortnightly meetings were held with the Emergency Consultant, Director of Nursing, Emergency Nursing Unit Manager and Quality Manager to discuss implementation of the project. 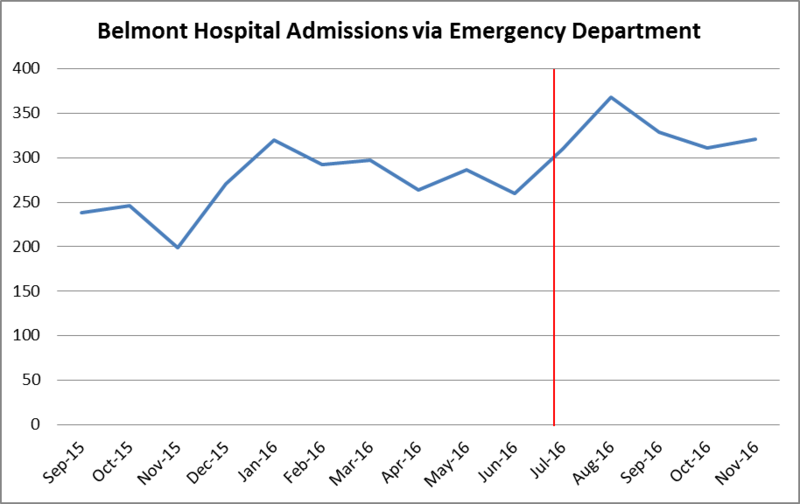 A Plan, Do, Study, Act (PDSA) cycle was conducted in July 2016 for two weeks and again in August for two weeks, when the final version of the escalation plan and daily report was implemented across Belmont Hospital ED. ETP increased from an average of 70% in February 2016 to 85% in November 2016, 5% above the stretch goal. 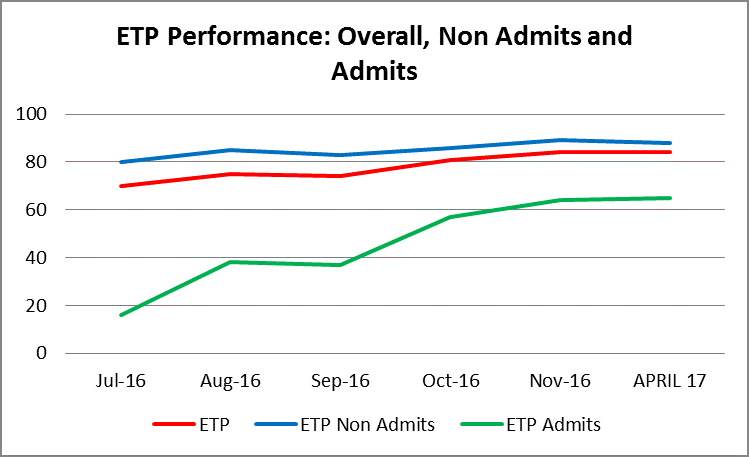 ETP for admitted patients improved from 16% in February 2016 to 64% in November 2016 and ETP for non-admitted patients improved from 80% in February 2016 to 89% in November 2016. Triage categories for ‘time treated’ remained within HNELHD targets throughout the project period, from July to November 2016. 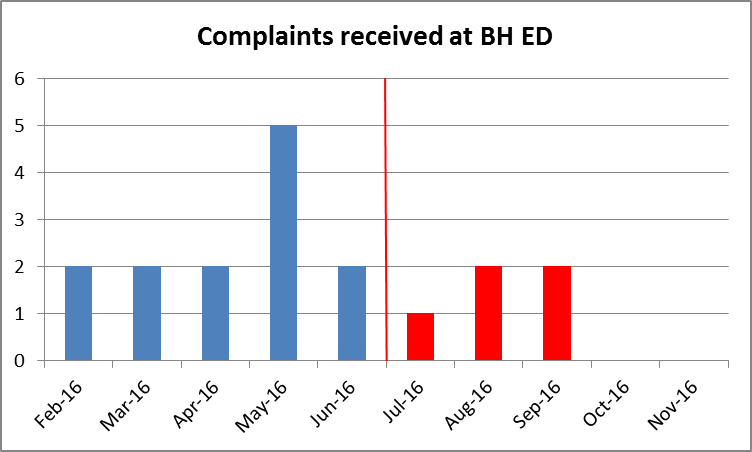 Patient complaints reduced from 13 in February 2016 to five in November 2016, a drop of 60%. There was an increase in positive feedback from patients and families, with follow up calls near the set target of 10%. Unplanned re-presentations within 48 hours reduced from 3.53% in February 2016 to 3.43% in November 2016, well below the NSW Health target of 5.2%. ‘Did Not Wait’ performance was reduced by 0.7% between February and November 2016, likely due to the 30% increase in admissions. However the result was still 0.7% above HNELHD targets. Transfer of care times from ambulances improved by 2% during the project. Between July and November 2016, there were no documented falls or clinical incidents (SAC 1, SAC 2 or London Protocols). The number of Aboriginal patients who ‘Did Not Wait’ reduced from 27 in the period from February to June 2016, to 13 in the period from July to November 2016. While an escalation plan isn’t necessarily unique to healthcare, it has not been traditionally implemented in the ED. Good communication between nursing and medical staff in the ED is crucial to delivering high-quality care to patients in a timely manner. It’s important to understand the leadership and working styles of nursing and medical team leaders, to maximise efficiency. Gathering data between 10pm and 6am was an issue that needs to be addressed to improve ETP during this period. Engaging medical consultants in the ED was a challenge throughout the project. The ED Director managed these conversations and is committed to improving processes for hospital admissions. Sullivan CM, Staib A, Flores J et al. Aiming to be NEAT: safely improving and sustaining access to emergency care in a tertiary referral hospital. Australian Health Review 2014; 38(5): 564-574. Sullivan C, Staib A, Eley R et al. National Emergency Access Targets metrics of the emergency department-inpatient interface: measures of patient flow and mortality for emergency admissions to hospital. Australian Health Review 2015; 39(5): 533-538. Sullivan C, Staib A, Eley R et al. Who is less likely to die in association with improved National Emergency Access Target (NEAT) compliance for emergency admissions in a tertiary referral hospital? Australian Health Review 2016; 40(2): 149-154. Australasian College for Emergency Medicine. Background Paper – Access Block. Melbourne: Australasian College for Emergency Medicine; 2014. Forero R, McCarthy S, Hillman K. Access block and emergency department overcrowding. Critical Care 2011; 15(2): 216. NSW Ministry of Health. Demand and capacity planning: Organise your service to build capacity. North Sydney: NSW Health; 2016. NSW Ministry of Health. Demand Escalation Framework 2015. North Sydney: NSW Health; 2015.